Hey all. Those of you who have been reading my previous posts know that I had a 4.5 year period during which I had to put my love affair with my Till’s on hold. Well as you would expect a lot of my Tills perished or barely made it through this time of neglect. However an unexpected survivor was my T. gardneri v rupicola. I actually acquired it just before my spare time vanished so I don’t have many progress pics. Just some before and after shots. As you can see from the pic below, it was already a good size when it arrived, and a real beauty. The pics below were taken a couple of months after I got the plant. I know I know, my wiring skills needs some improvement! Just try to ignore the wire and admire the plant. Having read up about gardneris, I learnt that gardneris have the reputation of being tough to grow in our local conditions. Knowing that I didn’t have time to attend to my Tills, I hung it upside down and in a semi-shaded spot. Basically I had a tray of Tills and I hung this beneath that tray. It was still outdoors and subject to rain, but had some shelter from the above plants from direct sun. It somehow survived the extreme heat though (as beneath it my area is fully tiled). When I eventually had a chance to check on the survivors, I was really surprised to see this little guy was still around. It’s not the prettiest looking plant anymore, as it is rather misshapen and U-shaped as it has been trying to grow towards the sun. But I am just happy that it’s still alive. I am sorely tempted to rewire and move this plant to a more visible location so I can admire it more often but I just know I will end up regretting it. After all, why mess with it when it seems to be happy, right? I can see it has thrown out some new roots and it’s leaves seem ever so slightly thicker so it must be grateful for the consistent watering now. I shall therefore resist the urge and leave it where it is! In the meantime, I’ll be over here waiting impatiently in the hopes that it will regain its beautiful form sooner rather than later! The most recent pics are below. Do stay tuned as I intend to put up a few more posts like this with Tills which have unexpectedly managed to survive against the odds. Do you have a Instagram/Facebook account or is a member of any Tilly FB pages? Would love to be in contact with you. 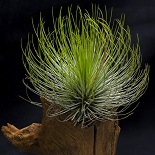 This entry was posted on August 29, 2018 by minigemm in Tillandsia and tagged gardneri, gardneri v rupicola, Malaysia, tillandsia.